My Pudding Cake…layered pudding+ cake…creamy cream caramel on the top and sponge cake on the bottom!!!!!!!!! !so worth making!!!!!!!! !made it after 5 long years..but turned even better alhamdulillah. 1. First part is doing caramel topping ..spread sugar evenly on ur pan and melt the sugar at very low heat until becomes nice red color..I can share a tricks making caramel..It often happens that our caramel gets burnt on one side and the other side remains color less..for this keep swirling around ur pan while making the caramel( pan ta ghuriye ghuriye sugar ta melt korte hobe)..and if the problem persists, one side gets darker than other sides, then add lil water to the pan and swirl again..u will get the same color from all the sides.. Beat sugar with milk..In another bowl beat eggs with light hand..If u really want smooth, creamy pudding never over beat or over whip your eggs..this trick applies to egg halwa also….Now mix beaten eggs with beaten milk and sugar..pour onto the caramel in the pan..
We are using melted butter for sponge cake for it will keep your sponge cake from being dry..
First, beat the egg whites with half the sugar, a pinch of salt and half the vanilla until stiff peaks are achieved. Set aside. In a separate bowl, beat the egg yolks with the remaining sugar until thick, pale and creamy. Add the milk, remaining vanilla and melted butter and stir. Sift the flour into this mixture and fold/stir it in very gently until combined. Next, very gently fold a third of the egg white mixture into this batter, whisk it in, then add all the remaining egg white mixture and fold it in using a spatula. Make sure to use a light hand to combine as any heavy handling or vigorous mixing will deflate the batter. Gently add dollops of this airy batter into the cake pan on top of the pudding mixture ..don’t worry layers will separate during baking. 4.We will use water bath technique to bake this pudding cake..For this you take a pan with water place your pudding pan onto it and then place it into the pre heated oven…Bake it for 40 min at 350 FH..
5. When done take it out from the oven… Don’t flip over immediately..Let it cool and then place it in the refrigerator for at least 3/4 hours before u flip over ..And while it’s in the pan, with a wet fork lightly prick onto the cake and add cake syrap using a spoon.. cake syrup is easy to make..Water, sugar and valilla essence..Thatz it..You can even use sprite or other colorless drinking soda as your cake syrap..It will keep ur sponge cake moist.. 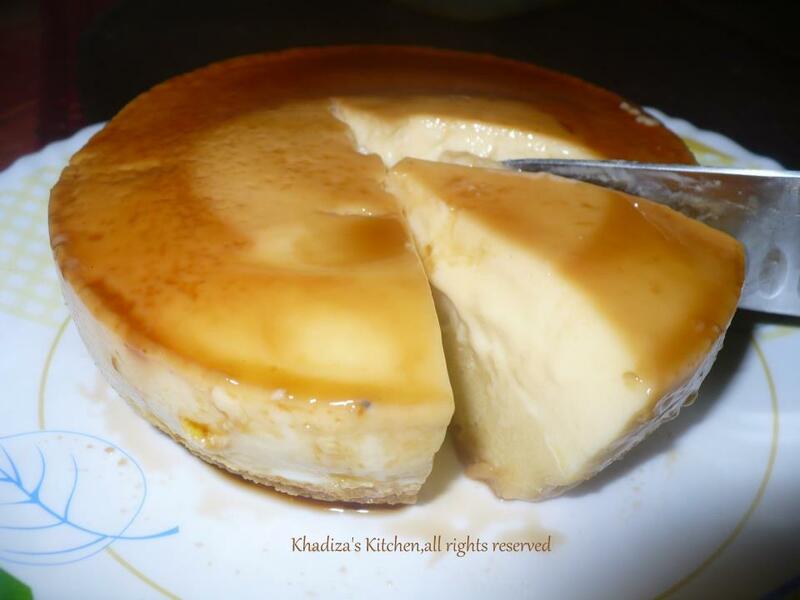 This entry was posted in Desserts and tagged cream caramel. flan, dessert, flan cake with less eggs, flan-cake, layerd pudding cake, pudding, pudding cake. Bookmark the permalink.